Nonprofits are good at showing appreciation to their volunteers in a wide variety of thoughtful ways, and those thank-you gestures are vital. No one can be expected to carry on indefinitely with work that goes unappreciated. But finding ways to motivate volunteers can be a real challenge. Rewards are not the most powerful kind of human motivation — because a reward by definition follows the act. Motivation, on the other hand, is what gives the volunteer a reason to step up in the first place. And just as there are two ways to reward someone — to give something they like, or take away something they don’t like — motivation also has two sides. We can create opportunities to volunteer that are designed meet the needs of our supporters, or we can remove the barriers that might keep them from volunteering. Ideally, we’ll do both — but removing the barriers has to come first, if volunteer activities can hope to compete with all the other attractive demands on busy people’s time and attention. Will door-to-door canvassing let me visit with friends and neighbors I don’t get to see very often? If there’s a need to be filled, there’s a motive for volunteering. If I agree to host the big fundraiser, does it mean I’ve got to rent a tux? If so, there’s a literal, out-of-pocket cost attached to this volunteer opportunity. But will that cost be a barrier for the volunteer? It depends in part on his financial resources, but also on whether his unfulfilled needs — for attention, for peer approval, for social interaction, whatever — outweigh the costs of that tuxedo rental. How can we begin to identify not only the needs waiting to be fillled, but also the barriers that may stand in the way of volunteers? 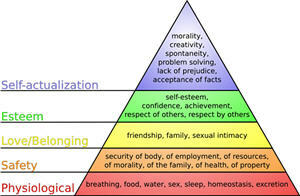 Dr. Abraham Maslow came up with a model for understanding basic human motivators or drives, a Hierarchy of Needs. You may remember seeing it as a pyramid diagram: the broad bottom tier is the things we need to ensure survival, and it goes up from there into ever more complex groups of needs related to quality of life and personal fulfillment. You’ll find other models to explain the mysteries of motivation, but Maslow’s Hierarchy of Needs can help to organize our thinking about all sorts of human behaviors from social networking, to Web2.0 fundraising campaigns, to music education. And the better you know and understand your volunteers, the more useful the tool is likely to be. Motivation is only part of the equation, remember. Would you expect a bare-footed volunteer to climb a mountain for your cause? No matter what reward or incentive is at the end of the journey, first he’ll need to have a pair of boots. And a rope. And maybe a climbing partner, too, depending on the challenge ahead. Am I physically, emotionally, intellectually capable of doing this for you? If I do this for you, what will volunteering cost me, in terms of needs that are not fulfilled, or in things I value that I will have to give up? The practical, physical and/or logistical barriers — those that match up with the most basic level on Maslow’s Hierarchy of Needs — are certainly the easiest to identify, and probably the easiest to overcome. No transportation to the event? Maybe you can arrange for a car pool, or change to a venue that’s on a public bus route. No wheelchair access to the board room? Maybe you can find another place to meet, or dial in a conference call. No time to fix a meal between a day on the job and an evening of envelope-stuffing? Maybe you can bring in pizza, or schedule the work for a weekend. As we start looking at barriers that relate to the more complex personal needs, however, there may be more questions than answers. Love/Belonging: Time given to nonprofit is time that’s not available to spend with family, for example. Can we find ways to include the children of volunteers in projects and events? Esteem: Will a youth who works with his grandfather’s service club quite happily behind the scenes draw the line at appearing in public with a group that lacks the “coolness factor”? Might a volunteer who lacks self-esteem turn down your request for their help, rather than tackle a task that seems too challenging? People are so very complicated, of course there's never going to be one easy formula. But I find myself drawn to Maslow's Hierarchy as a strategy-planning tool because it gives a starting point for action (those practical, physiological needs and barriers) — with a clear route (up through the levels of the pyramid) to travel from there. Remember the example that Aaron Hurst gave? If you are starving to death, a BLT is more attractive than some TLC. To me, it makes sense to make sure your volunteers can get across town to attend your meeting, first, and concern yourself with who needs a hug once they've made it in the door. Hugs, yes, very important — but first things first. What do you think? Is this a useful approach for trying to understand the factors that affect your volunteers, and impact your nonprofit's operations as a result — or can you suggest another way of thinking about those needs and barriers? Experience in the nonprofit trenches can attest that Dr. Maslow got it right on several points, at least — the majority of functioning people do have a need to belong to a group, to respect themselves and be respected, and to contribute to society in a meaningful way. With the right motivation to meet their needs, volunteers will do what they can. Take down whatever barriers you can identify, then, and you may just to find that your volunteers can do a great deal more than you ever thought possible. I don't like the hierarchical aspect of Maslow's model. Poor people can be just as kind as rich folk. I'm sure those in the voluntary sector know this. Manfred Max-Neef has a different model that I think is better. It also includes leisure as a need! I think it is a great idea to be aware of our needs other than the physiological. And it makes sense to think about the needs of volunteers. If Maslow's Hierarchy helps this, then that's great! Evan, I did think about Max-Neef's chart of fundamental needs, and it certainly is more complete - not to mention the appeal of a model that classes human needs on a continuum from 'subsistence' to 'freedom'! - but it was Maslow that, for me, made an easy leap to concrete, do-able actions. We need to be looking at motivation from the volunteers' viewpoint: Not 'what can we give them?' but 'what do they need? Regardless of whether you prefer Max-Neef's model or Maslow's model, the key point I got from this post is being observant and attentive to perspective volunteers needs. Having served in many different roles as a volunteer, both online and off, I can attest that this consideration is lacking in many organizations. It's difficult when resources are tight, but simple, inexpensive steps can be taken to ensure the overall well-being and moral of volunteers. This is a great post that applies to a wide range of organizations that solicit volunteers. Thank you for sharing your thoughts with us on this subject! Dean Rieck just posted a piece called Six Ways to Get People to Say "Yes" over at CopyBlogger.com. It's geared toward businesses who want to make sales, but the principles of the "psychology of persuasion" are universal -- so volunteer managers and nonprofit event coordinators should find the article interesting. How do social change movement volunteer efforts fit on this continuum or scale? It is nearly ALWAYS going to be somewhat dangerous to challenge the status quo in the name of a good cause; but some of us do it, because I think that we see a need much greater than our own individual needs? But, the rub is: so long as the change we seek, has not been made, more people see risk, than see benefit, in aligning with a change effort. They see that they become targets, and we can't talk very openly about the ways in which we help each other to persevere, because that would be playing right into our opponents' hands. If too many people are fearful, if the need is overwhelmingly for "Safety," then you have little chance to promote change, and few potential volunteers, seems to me? Linda, I suspect you're right that Safety holds a fair number of barriers for volunteers for social change causes. Different people have different perceptions of and tolerance for risk, as we know. I wonder if one answer might be to find a task to fit the individual? If someone's not comfortable to wear a button and speak out loud, for example, perhaps there might be other less public ways for them to contribute? This falls right in line with what any good supervisor should do for his or her employees. Why should the motivation be any different towards volunteers? The challenge is understanding what motivates you as a volunteer manager may not be what motivates each and every volunteer. It is also a challenge to find ways to discover how to best motivate each individual volunteer. It is appropriate to ask. One caution is that Maslow's Hierarchy of Needs does not reflect some cultures very well. This can be summed up by the platinum rule (vice golden rule): "Treat others how they wish to be treated." Roger, thanks for the "platinum rule" - that's worth a poster on every office wall!